The last post looked at numbers in relation to what is known about ancestors. 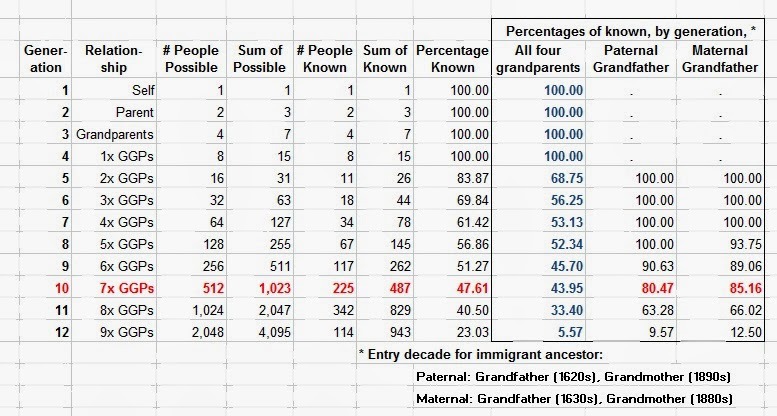 In this case, the number was the percentage of known ancestors in the 10th generation (see image in prior post). At that generation, one had one-thousand-twenty-tree (1,023) ancestors (allowing for duplication due to possible intermarriage during the later generations). After we have a brief review of the approach, let's take another look. What was of interest was that the range for people responding to a query went from the teens, and below, up to a whopping 83% (Yvonne). 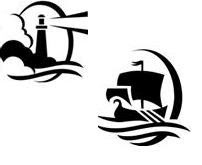 The query was posted by Randy Seaver in his Saturday Night Genealogy Fun post at his Genea-Musings blog. Randy, himself, had a number about 53%. Again, on the approach, the idea is to count from yourself backward through the earlier generations. So, you have two parents; they have two parents, and so forth. So, it's a power of two (minus yourself) that you have each time. Some generations can have a 100% number, if everyone is known. We usually expect that with the earlier generations (closer to you). As well, if you take your four grand-parents, what you know about their heritage will differ. For some, you may know a lot. For others, you many know little. What has been noted is that many, with New England ancestry, know a lot about their ancestors. The high number, reported above, was for someone who was from Quebec (Canada). Fore note: Randy had four columns: possible - #1, sum1; identified - #2, sum2. He reported, for each generation, sum2/sum1 (times 100, to get the percentage value). In the below, what is reported is #2 over #1 (adjusted, accordingly). With this, we can see what we know for each generation. To the prior table, I added three columns (see image in this post). Each of these will show "Percentages of known, by generation." The first column gives the ratio (converted to percentage) by generation, in toto. 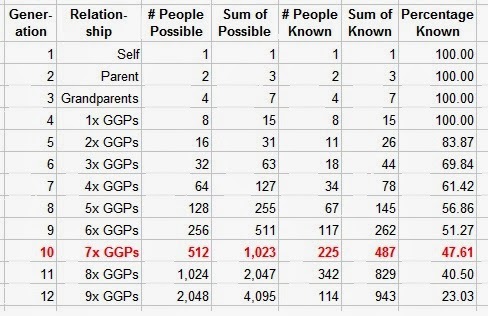 In this case, 45.7% of generation-nine ancestors are known (117 of the 256 possible). As one can see, this percentage drops off as we go backward in time. So, too, does the accumulative numbers drop (51.3%, which is 262 of the 511 possible at this generation). Now, here's the thing. We can break out the contribution by each of the four grandparents. In this case, both of the grandmothers were members of families who arrived later (1800s). So, we can then focus on the two grandfathers (1600s arrival). The next column is the number for the paternal grandfather. Then, we have a column the maternal grandfather. The first thing to notice is that we have 100%, for these two, out through generation seven. Then, we get the drop off that is expected. But, notice, too, that the percentages are high for a couple of generations, above 80%. After that, the paternal side goes down more quickly. The big reality is that, after generation eleven, we get a huge drop off. It might be good to compare these generations against the trees of the better-studied individuals (rich and famous, for whom genealogists like work). Caveat: Generation 10, in this case, is for someone who was born toward the middle of the 1900s. Since then, trees for many might be talking generation 12, or more, for the same ancestor (immigrant). 08/13/2015 -- Another example, using the generational count. 08/14/2015 -- I will do the chart using Dr. Frank's ahnentafels (BB Gardner and LF Wilson). People have thought using numbers for a very long time (arguable point emphasizing the intuitionists' school's view - see Brouwer, for one), The computer can be a boon to that sort of thing. Too, people have fun, even genealogists. How else will they suffer the tedium (again, arguable, as all sorts of other means can be found)? -- Have you noticed the proliferation of genealogy blogs (look at Randy's list - see below)? Of course, this is such an addition. Now, that being said, I ran across Randy Seaver's Genea-Musings, today (had been there earlier, but the difference, today, was that I got caught - one needs to be teflon'd to avoid being entrapped in the sticky web). He had used the Saturday Night Genealogy Fun as motivation to show his number. In brief, the idea is to count how many ancestors are known up to a generation, in this case, 10, or further back. His post has a table that shows the accumulative count by generation. In the comment section of Randy's post, many researchers reported their numbers. The range was wide from 83% (more later) down to the teens. Randy's number was 52.83%. In other words, of the 1023 ancestors (which might be duplicated due to intermarriage), he has identified 541. Crista Cowan seems to have started this, back in August of 2012. Her number is a little lower (the 30s). The largest count that I saw was Yvonne's who claims a whopping 82.7%. In other words, she knows 846 of her 1024 ancestors through generation 10. Earlier, I had mentioned that Princes William and Harry had 100% known up to about generation 8 with only a few holes after that (based upon a quick read, in a library, of a book that showed their heritage). It's nice to see this same level of filled-in tree can be found outside of the ruling royals (after all, the story is that they have to be aware in order to remove possible interlopers). So, now, given that. 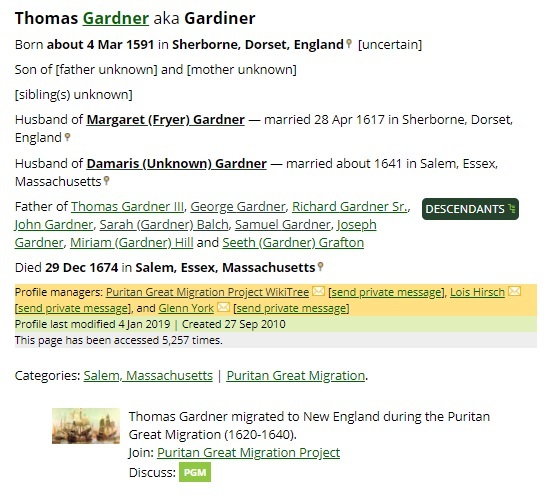 I have been working on some trees that include Thomas Gardner of Salem. On a quick count, I figured that the number, to date, would be close to 50%. See the image. Disclosure: This represents about four years of work that, in part, leveraged off the work of others (nod, of course, to ancestry.com and rootsweb.com). Now, in looking at Thomas and Margaret, how many of these charts could be written up today? Granted, they would only be two of five-hundred-and-twelve (one-thousand-and-twenty-three, from your parents back) ancestors for that generation. That, then, brings up how important it is to know about the collateral families in one's tree. We want to get out to about three or so generations and, then, get a count of such. That is on the task list to be done prior to the next major milestone (see 400th). 02/19/2014 -- A relook from two generations out. 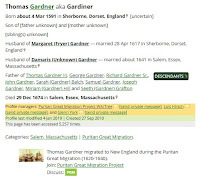 There has been much written over the years about New England and the immigrants, such as Thomas Gardner and other Gardners . In some cases, there is active work to build an informational site. In other cases, we have books that are on-line. What we are doing here is collecting and providing links to these sites, categorized by type. We start with the TGS sites and then will add others as we find them. Too, we have a list of earlier posts that pointed to these. Thomas died on 29 Dec 1674 and was buried in the plot at Gardner's Hill. His body is missing; we have some work cut out to find out the real story. 02/05/2014 -- Added related families (need to update links). 02/28/2019 -- A few more links plus an image from WikiTree.